Mr. Ong said that more possibilities could emerge with progress in the Internet of Things and Artificial Intelligence. 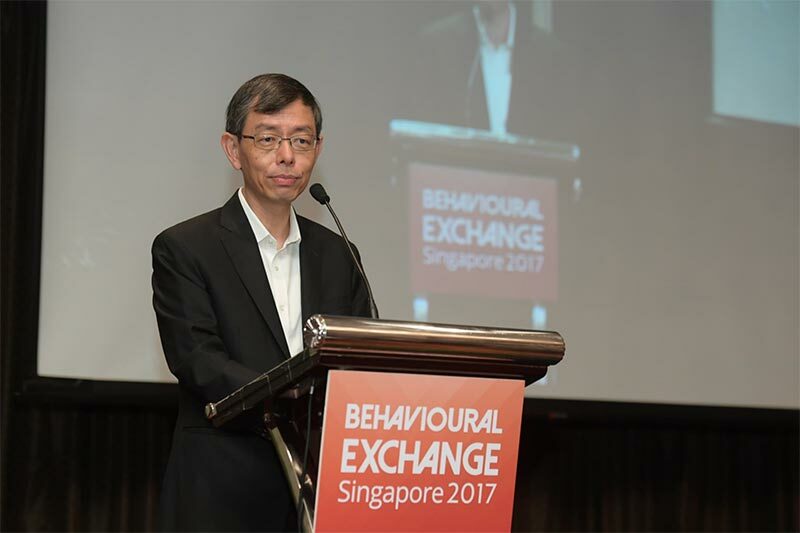 Mr. Peter Ong, Head of Civil Service, Singapore spoke about the Singapore government’s use of behavioural insights (BI) in his opening address at the 2017 Behavioural Exchange (BX2017) Conference. Recalling a similar speech he gave two years ago, Mr. Ong said that at the time, the Singapore Public Service was focusing on low hanging fruits when it came to the use of BI, such as reframing messages on posters to encourage people to give up their seats in buses and trains, and making simple tweaks to enforcement letters. During the following two years, significant progress has been made in applying BI to public policies and programmes in Singapore. BI is playing a role in people-centric, effective and timely programmes. Mr. Ong shared a couple of recent examples. The Central Provident Fund (CPF) Board wants to encourage people to save enough and make better financial decisions over their lifetimes. “The CPF Board found that sending more personalised letters and including what is known as a “pre-commitment device”, which suggested that an appointment had already been reserved for the person, more than doubled the attendance for its retirement planning programme from just under 14% to more than 31%. While this only addresses a small part of the retirement adequacy challenge, it contributes towards nudging more citizens to prepare better for retirement,” said Mr. Ong. The second example was that of the Health Promotion Board (HPB) trying to get people to adopt healthier lifestyle habits through a fun and social approach. It was found that 2 in 5 adults were not meeting the target of 150 minutes of physical activity a week. So, HPB launched the National Steps Challenge in 2015. It used a combination of technology, nudges, and gamification, to get participants to take 10,000 steps per day. By 2016, 78% of participants who were previously inactive reported they were sufficiently active, with 150 minutes of activity per week since joining the Challenge. HPB has also been experimenting with other efforts such as the Healthier Dining Programme. Food and beverage establishments can come on board to provide healthier menus, accompanied with an easily identifiable logo that encourages customers to make a habit of buying healthier meals. In another initiative, HPB identified the holy month of Ramadan as a timely juncture when smokers in the Muslim community would be most receptive to quitting smoking and launched the “Ramadan I Quit” 28-Day programme, tapping on social support in the community to motivate the smokers to quit smoking. In addition, as governments shift their focus in service delivery from agencies to citizens, services are being clustered around key milestones, such as buying a home or accessing healthcare services for the elderly, A combination of nudges such as timely prompts and social norms, delivered in an anticipatory instead of reactive fashion (facilitated by the move to digital), can be used to encourage positive behaviour at these critical moments. But Mr. Ong sounded a note of caution saying that BI is not a silver bullet. “It is by understanding how BI can be used in combination with other evidence-based tools that we can provide robust insights and come up with innovative and productive solutions to policy problems,” he explained. An example of such an integrated approach is provided by one of the Land Transport Authority’s (LTA) initiatives. The LTA tracks how crowded each train station and platform is, so that the frequency of trains can be adjusted to meet demand. sensors have also been installed in public buses to track crowdedness in real-time. This data is then transmitted to smartphone bus apps, notifying commuters about the availability of seats on buses along the route. Such information can help to shape the travel behaviours of commuters, enabling them to plan better. In another example, Khoo Teck Puat Hospital used BI, data analytics and design thinking to reduce hospital readmissions. The hospital staff designed a series of interventions using BI and design thinking to make patients’ homes more age- and ability-friendly, after identifying frequent re-admitters through data analytics,. For instance, ramps are installed to facilitate wheelchair users’ access to toilets with a kerb at the entrance. This was complemented with nudges w to help frequent admitters keep up with regular health reviews, and adhere to shared care plans, so that the different types of support provided by care-givers, service providers, and community nurses can be better coordinated. Considering the future, Mr. Ong said that more possibilities could emerge with progress in the Internet of Things and artificial intelligence (AI). There aree prototypes of smart medication dispensers that can provide reminders when it is time to take pills. They could be linked with the medical professionals so that dosages can be modified based on the person’s actual condition. AI could provide additional medical advice.